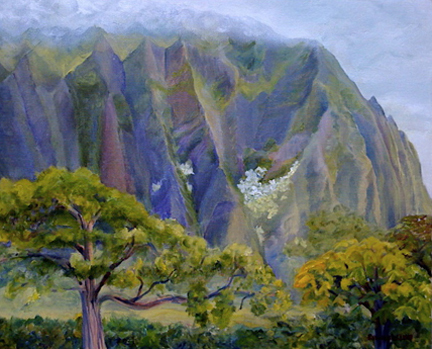 There’s something about the Ko‘olau mountains that draws painters to this landscape again and again. 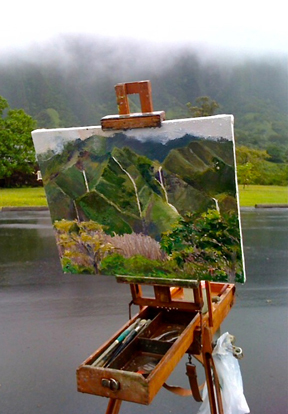 Besides their obvious lush and weathered volcanic beauty, they challenge us plein air painters to capture their form in the ever-changing daylight. 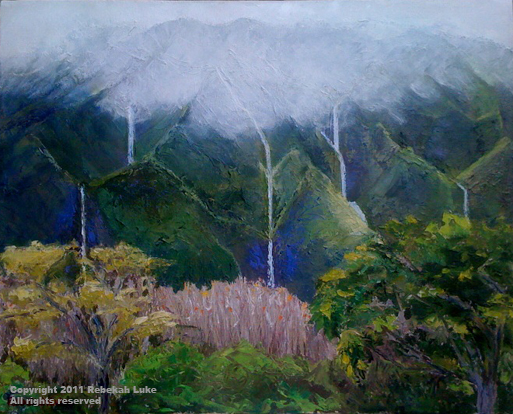 I spent a lot of time studying the ridges and valleys in my most recent diptych of Lanihuli as viewed from Luluku. Together, the panels measure 60 inches by 22 inches, unframed. Oil on canvas board. Perhaps this is the year you want to give something big and long-lasting to your special someone. I have an idea! How about a piece of fine art? 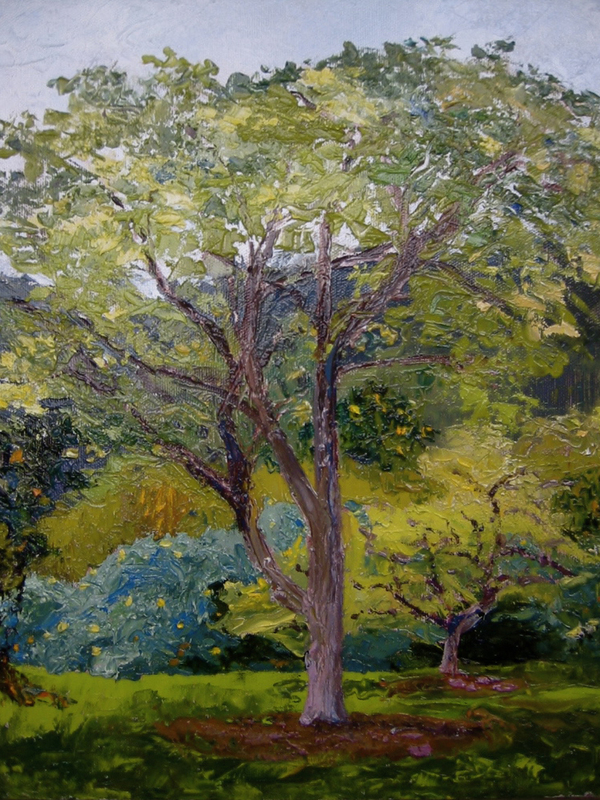 An oil painting that you like, for example, can be more affordable than you think and retains its value over time. It can brighten a home or office interior and bring cheer to the environment. Most local artists and even art galleries are willing to negotiate retail prices and work with customers to allow them to purchase on layaway — in installments. Don’t be afraid to talk to the artist, ask questions, and perhaps move that item from your wish list to the reality of your collection! Considering it’s holiday time, and everyone is marketing their wares, here’s some shameless “hard sell” on my part. 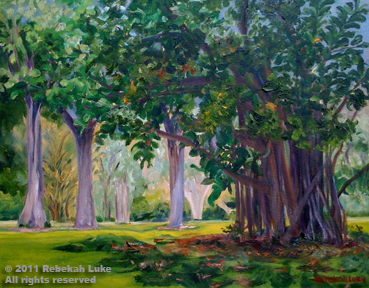 I invite you to view my virtual gallery of paintings once again at https://rebekahstudio.wordpress.com/paintings/ and hope you’ll consider making a purchase or tell a friend. There are also a few in my retrospective collection that I could be persuaded to part with. Hawaiian places — places you have been or places where you’d rather be — are my favorite subject. Each painting is a one-of-a-kind original (sorry, I haven’t made any reproductions) and comes with a frame ready to hang. Thank you so very much for your consideration! Happy holidays! For the past few days I’ve done the things I like to do. There seems to be a balance of energy around me, and I feel well! This is my 200th blog post to you! A photo panoramic view of Lanihuli peak from Luluku on a sunshiny winter day. I've made several paintings in oil of the vicinity. I like to paint in the landscape as much as I like to blog. Access is from Ho‘omaluhia Botanical Garden. Please see the painted images below. I had a Reiki client this morning, too. That is great for my being. Then I was glad to get some nice email from some folks I hadn’t heard from for a while. The studio is clean, that is, clean enough that I’m not going crazy with clutter, and I’m expecting my cousin Jim this afternoon when we will continue working on a new book about our family, my grandparents’ clan. I’m on track with writing the lesson plans for the Painting classes I’m teaching starting February. DH and I are sleeping very well since moving our bed back to the original master bedroom that we vacated to accommodate my aging father (1914-2003) and later Miss Marvelous, while her parents worked and she was not yet in school. Anticipating the kids’ move to Italy in a month or so, we disassembled the crib and moved back in after almost 10 years. The feng shui is better in the living area, thanks to a simple rearrangement of furniture to allow for a freer flow of energy. I’m eating more sensibly since the holidays, though enjoying Chinese New Year food, and, at this very moment, the aches and pains of aging are non-existent. I’m listening to soothing harp music and not a ball game on TV. Yesterday I painted with the Thursday group and got some good critique from Val and Naomi, who paint differently from the way I paint, but they have good eyes and suggestions to improve the canvas I’m working on—a morning scene of Kuilima Cove on the North Shore. I was sorry I didn’t bring a large blank canvas, for the vog gave way in the morning to clear skies and a spectacular landscape in the top photo that I should have been painting instead. I snapped two pictures with my iPhone. After posting them on Facebook, Kelley commented the mountain scene was so beautiful to her. I agreed. Nature in the right light. Yo posted she almost mistook them for one of my paintings. In fact, I have painted scenes from this place on other occasions, and surely will paint another now that I can see the mountain up to the top, for there were few clouds, and definite form and cast shadows from a point source—the sun! 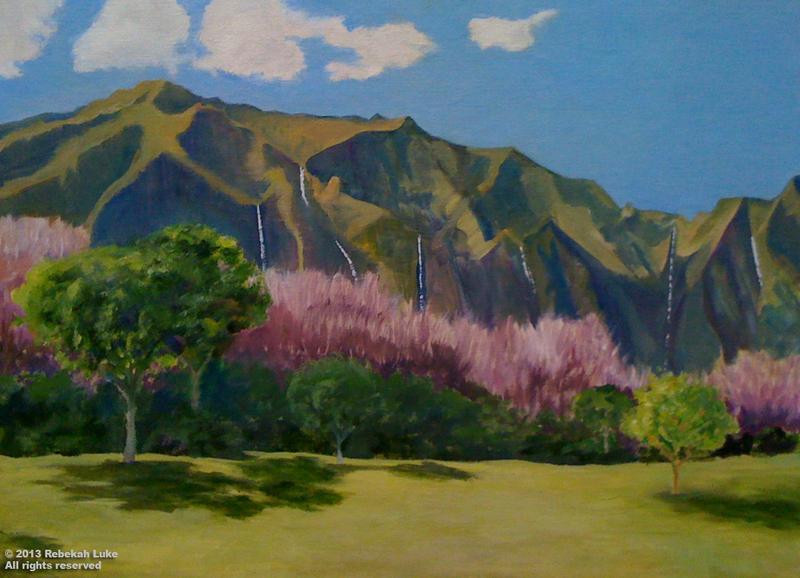 "View of the Koolau Mountains" by Rebekah Luke. Richard Guy Collection. I wonder if it is true that in olden times the waterfalls of windward Oahu ran all the time. Olden times meaning before water was diverted to the Ewa plain for sugar cane and land development. 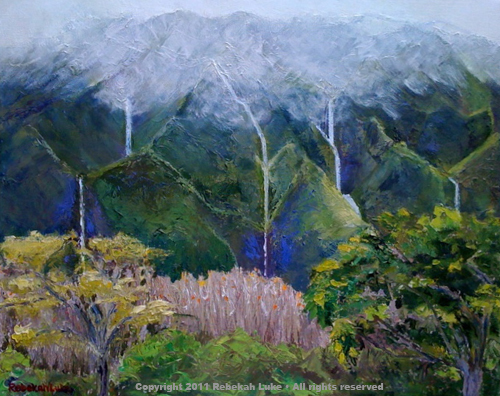 At the present intersection of Kahekili and Likelike highways, while waiting at a red light, a rain storm typical of our wet season had just stopped and the clouds lifted to reveal a spectacular scene of the Koolau mountains. 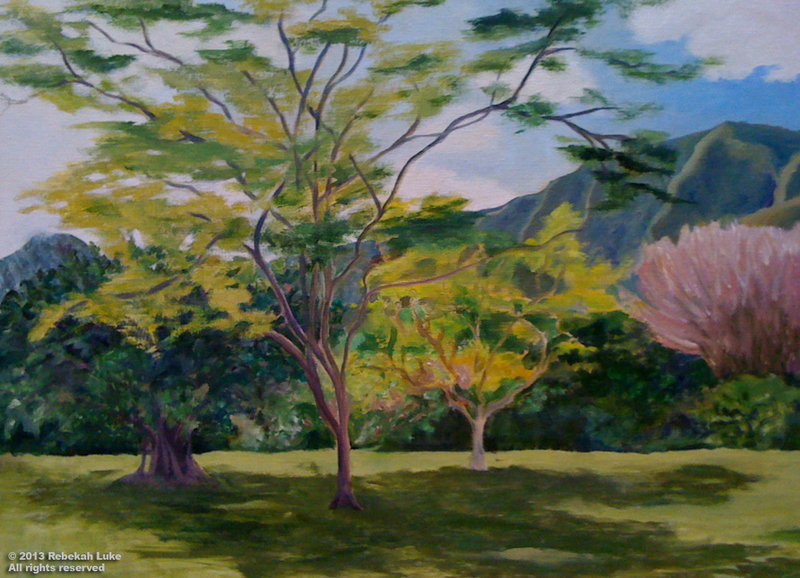 I was on my way to Hoomaluhia Botanical Garden at Luluku and made up my mind to hold the vision in my memory so I could paint it. For in just a few quarters of an hour the sun came out again and the waterfalls disappeared. UPDATE, September 11, 2011: As you will see in my 9/11/2011 post, I have made some changes to this painting, and I think you may like the finished work better. Thanks for visiting Rebekah’s Studio.